What’s the best way of instantly boosting the skills available to your team, running more specialist activities for patients, increasing job and patient satisfaction, improving retention of great staff? With a budget of £0? It is simply using all the talents of all your staff. What unused potential can the staff team tap into? One of the many benefits of this idea is that role flexibility creates greater efficiency and variety. It also responds to individuality and uniqueness meaning greater staff satisfaction. It also means that patients will have more to relate to and connect with on a personal level. Perhaps you have an artist in your midst who can create graphics or visuals for your next annual report or provide artwork for your lobby or conference room. Maybe you have people who are multilingual and can serve as interpreters or translators for foreign guests or in international correspondence. If you have ever paid a translator or hired a service to translate a letter into another language, you will quickly find out how valuable this person could be. Recognizing the value of the whole person benefits both the individual and the organization. It allows people to blossom beyond their job description, saves the company money, and could even reduce turnover. It’s simply amazing how people can work together for years and know little or nothing about one another beyond the job. The list of ward and indeed wider hospital examples of role flexibility are dazzling. They exemplify all that is remarkable and wonderful about mental health inpatient care. Similarly, many of the photos in this feature are of staff impressively demonstrating a Whatever it takes…… approach at the Star Wards Festival! A receptionist runs drama sessions for patients and a guy from the mailroom runs music jamming groups. The patients benefit from the groups and the members of staff have a much more enriched working life and increased understanding of patients’ strengths, needs and aspirations. No matter what their role is all staff take turns chairing ward meetings. A Housekeeping Assistant who is fluent in 5 languages happily puts her translator hat on and helps with patient assessments and interviews on the ward. One Housekeeper also has a nursin3g assistant role, which includes going to patients’ homes. This seems to increase staff retention because it’s a more enriched role. Nurse Therapy Assistants split their time between nursing and OT shifts, and work evenings and weekends. A staff nurse is liaising with the local college’s ‘enrichment’ officer who has offered to be a volunteer herself! She’ll be carrying out activities such as jewellery making, photography and pottery. The unit provides a session each week called ‘cuppa with a copper’. An opportunity for patients to meet and informally chat with a police officer over a hot drink. 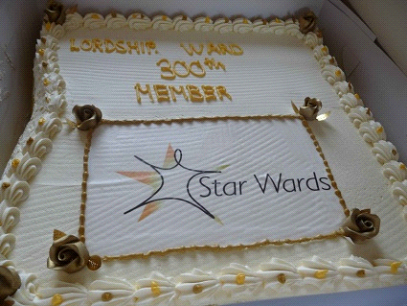 Celebration for Lordship ward, St Ann’s Hospital becoming Star Wards’ 300th member. This was an amazing day for me. I’d set up Star Wards after I’d been sectioned, as one way of trying to reciprocate the exceptional support I got (and 7 years on, continue to get) from St Ann’s. And this was a few years on, in June 2008 and ‘my ward’, Lordship, was becoming our 300th member. The hospital had pulled out all the stops for the event, which was warmly blogged by one of the two local MPs who came, Lynne Featherstone. The picture below represents for me all that is so generous, flexible and committed about hospital staff, including those not based on the ward.Nurses, secretaries, managers…. 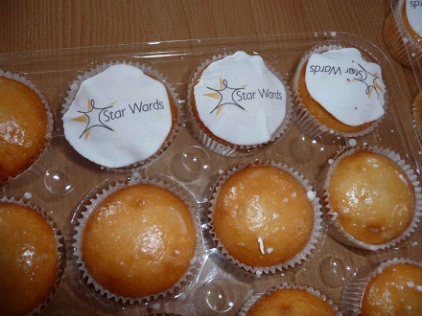 All pitch in with Star Wardsifying the fairy cakes. Some wards are carrying out skills surveys of their teams, on a structured or informal basis. It could be an questionnaire for staff or simply asking at a team meeting or in individual supervision and should of course include receptionists, ward clerks, domestics – even psychiatrists have non-clinical skills! (Most of them…..) How cool would it be for a psychiatrist to be running a reading or cooking group? What a great message that would convey about putting patients rather than status first!